Welcome to the April round of Taste Creations! This time we are sharing with you recipes that use dark chocolate. I love dark chocolate. I love that it is good for you, if used appropriately. 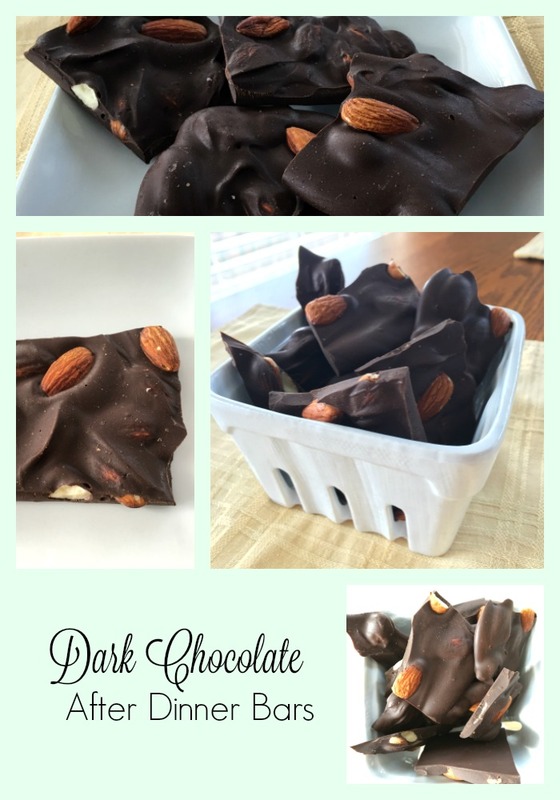 There are such good antioxidants in dark chocolate (don't combine it with milk, as the antioxidants will attach themselves to the milk) and theobromine (which helps tooth enamel), is high in minerals like potassium, iron, magnesium and copper, and improves blood flow to your heart and brain. Do you need to hear any more??? 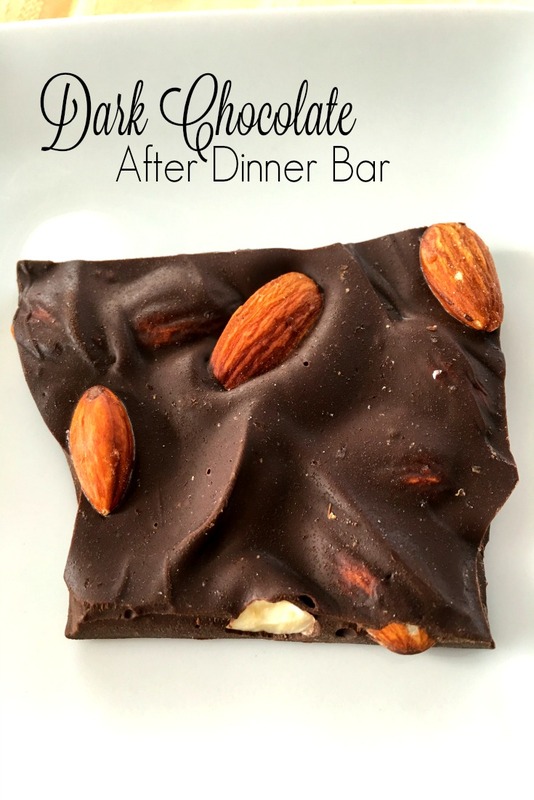 This simple bar is a great after dinner treat when you don't want a full dessert but want a little something. With dark chocolate, toasted almonds and sea salt, this is the perfect "little something." To make this even more fun, I purchased a dark chocolate Easter bunny, on sale this week for 70% off, (8 oz)chopped him all up and melted it down in the microwave in short spurts of 20-30 seconds, stirring a fter each round. While the chocolate was melting, I toasted my raw almonds (1/2 cup) in a small skillet until I could smell their toasty goodness. I stirred half the almonds into the melted chocolate. I poured the chocolate onto a jellyroll pan covered with parchment. I then put the left over almonds on top. I let the chocolate harden in my refrigerator for 30 minutes, grated pink Hawaiian salt on top, and then broke it up into pieces. I like making pieces that are not uniform in size or shape! 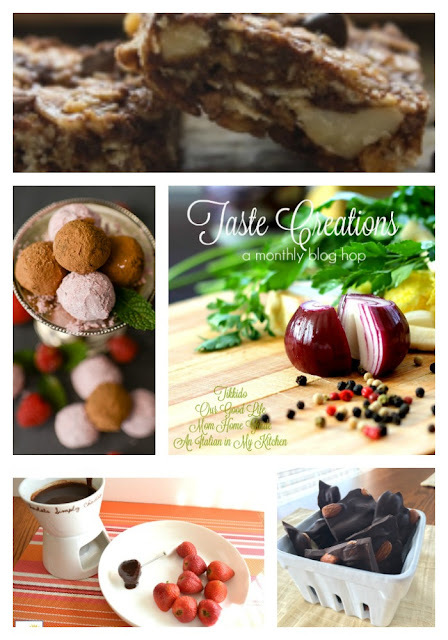 Check out this other, luscious, dreamy and creamy, dark chocolate creations. No, go ahead, you will be so glad you did! These look delicious! Dark chocolate is my favorite! 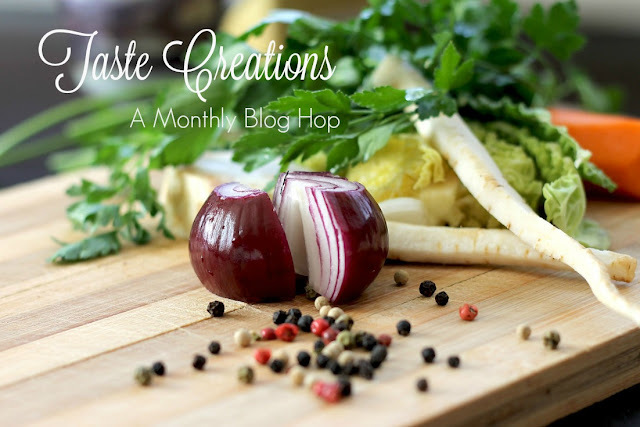 It's been fun doing this blog hop with you! Wow Terri now this is my kind of bar. Looks and sounds amazing, I can't wait to try it. Sharing. That's the perfect sweet treat I'm always looking for at the end of the day! 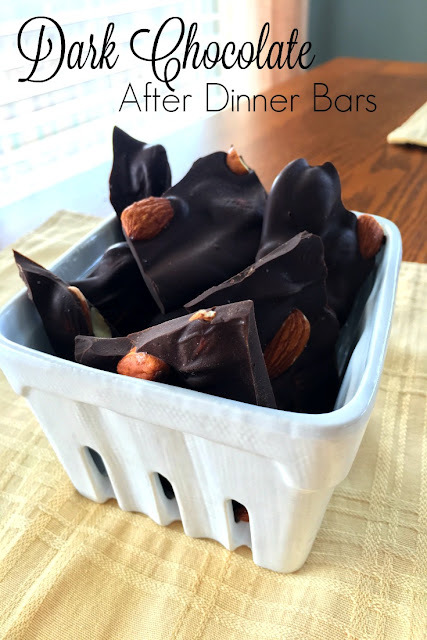 Good tip to mix some of the almonds in the chocolate, and set some on top. OMgosh - these look amazing! Wow, what a great idea, make your own. For me, I'd use a chocolate made with Stevia and that would work for me just fine. Will have to do that, thanks for sharing. Yum! I love the minimal ingredients in this dessert recipe. You could go really fancy with really high quality chocolate and almonds. Terri this sounds so wonderful and so simple! I'm pinning this to Thoughts of Home on Thursday but also to my personal boards so my family can have some. Your dark chocolate looks professionally made. Terri this chocolate looks so good and is good for you! Your post is such a happy addition to Thoughts of Home on Thursday. Thank you SO much for sharing the joy.